1. Noche Buena: My house smells like frijoles negros y cebollas right now (that's black beans and onions for you non-Spanish speaking folk!) and we're gearing up for Noche Buena! I'm spending Christmas with my mom's side of the family and being Dominican, we're having pasteles and shrimp, queso blanco, a roasted pork (which I will not be eating), yucca, frijoles, platanos,sangria...the works! Let me tell you, you haven't had Christmas dinner until you've had it at my house because we Dominicans know how to cook! I can't wait for the yummy feast! The house smells delicious right now! And since we're Americanized we open our Christmas presents on Noche Buena instead of on 3 Kings Day. Did you know that the 12 days of Christmas are actually the 12 days between Christmas and January 6? January 6 is supposedly when the 3 kings (of Orient are...) brought their gifts to the Baby Jesus, so traditionally presents are opened on that day! There, now I taught you something, go spread the word! 2. 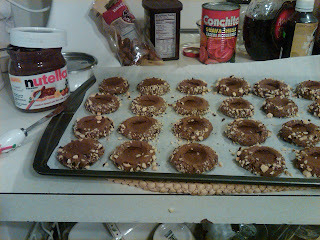 Christmas Cookies: I made Chocolate-Hazlenut Nutella Thumbprint Cookies this year! Mmm mmm mmm! I'm such a sucker for Nutella! I could eat it all day! 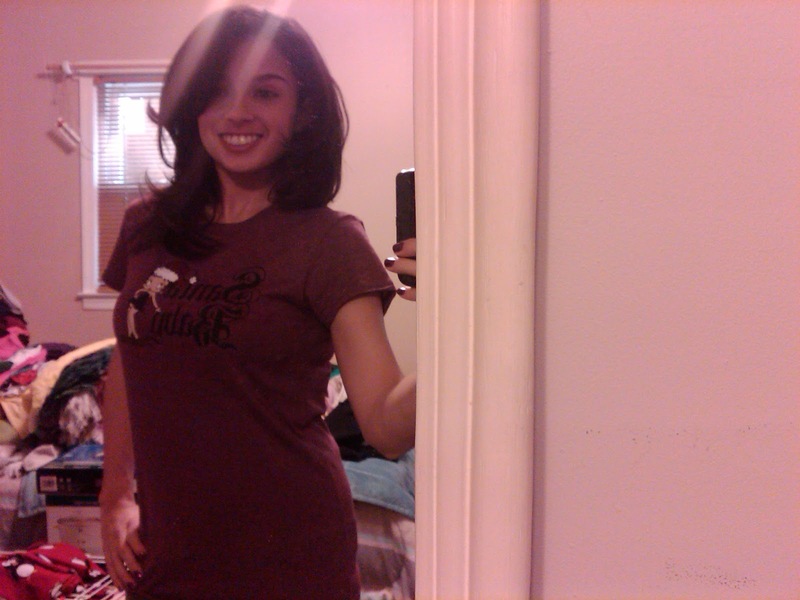 (*Note to the Nutella folks out there if you want to send me some samples =D) Check em out! Aren't they cute? Don't they look delicious?! 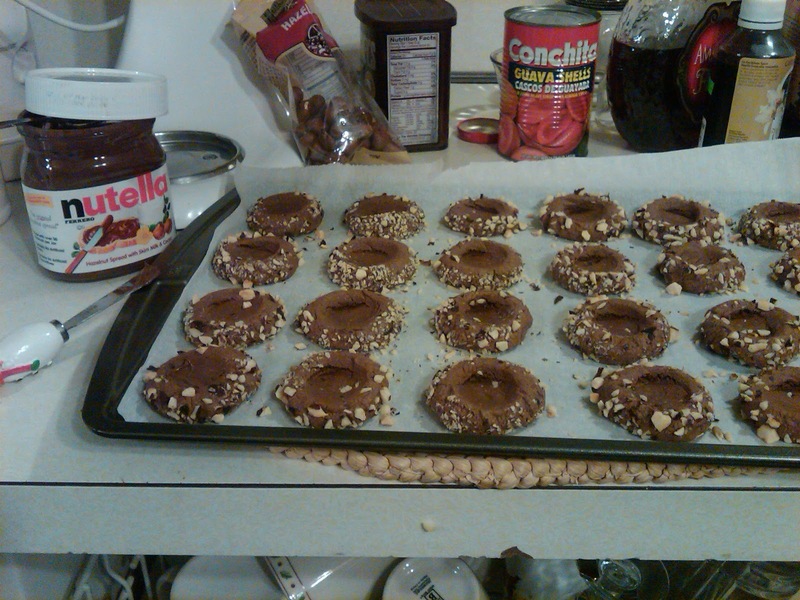 As soon as they're cool, I'm gonna spoon some Nutella onto them and they'll be perfect! Sorry for the picture quality! I'm hoping a certain man in a big red suit brings me a new camera this weekend! Your hair looks great! Also I didn't know all that stuff about Noche Buena and I will be sure to spread the word! Even though I should probably already know all about this given my mom is Honduran. LAME, Madre! Anyways I hope you have a great Holiday! Love, love, love the farrah do!!! :) Merry Christmas to you my dear!! !